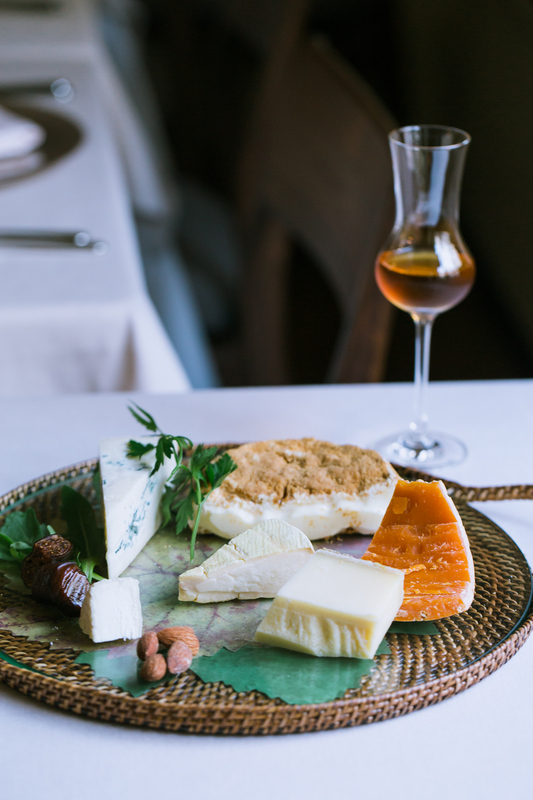 Are you passionate about classic, authentic French cuisine? If so, Maison Finistere might be just what you’re looking for. Tucked away in an old Showa-era building on the east side of Ebisu station, this is the kind of place you’ll want to return to, again and again. But regardless of the words used to describe Oki’s dishes, it’s clear he’s both disciplined and passionate about French cuisine. But even before he discover French cuisine, Oki was initially infatuated with the food at home, as prepared by his mother, who cooked everything from scratch. She taught him how to make cream puffs and pound cake while the young Oki was still an elementary school student! 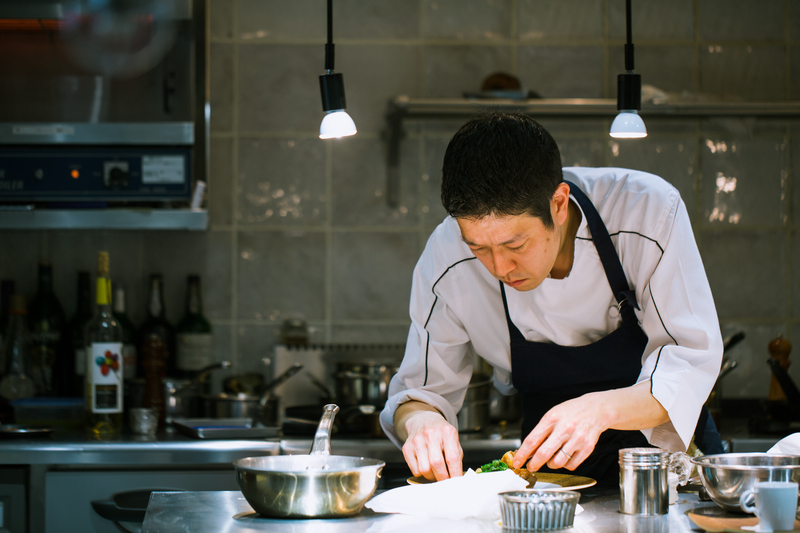 After graduating high school in Tokyo, Oki moved to Osaka to attend culinary school. During his second year, he participated in the school’s program in Lyon, France, where he worked at Le Sud, by the legendary Paul Bocuse, in Lyon. Oki still visits Le Sud on his trips back to France, though he was initially disappointed by this placement, because it was a brasserie and not a formal restaurant, and it was also lacking in Michelin stars. 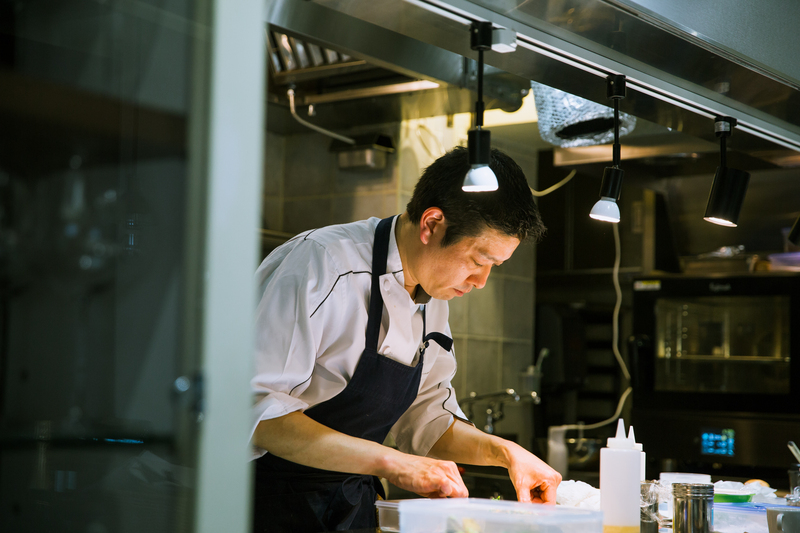 However, after working at a couple of restaurants in Tokyo, Oki returned to France at twenty seven, to work at a restaurant on the coast in Brittany. This restaurant was unpretentious, serving locally sourced fish with beurre blanc sauce. It was the kind of place far away from gastronomy and far from Michelin stars, but it was food that was totally new to Oki. He was overwhelmed by the taste of the butter in the beurre blanc sauce, and felt grateful for his colleagues welcoming and accepting him to their team. Brittany is the largest French peninsula stretching towards the Atlantic Ocean, and in the extreme west lies Finistere, a department of France. Finistere derives from the Latin, Finis Terrae, meaning the end of the earth. And to Chef Oki, Finistere is his culinary destination. 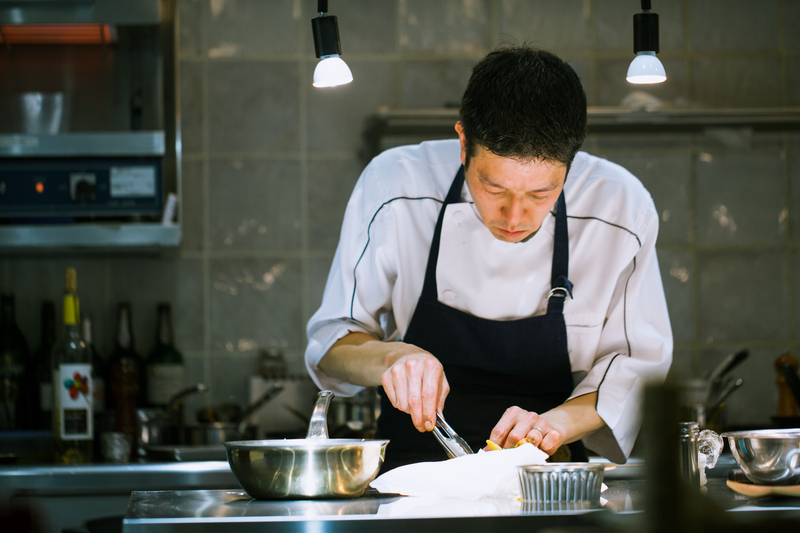 After staying in Brittany, Oki moved east to Arbois, Jura to work at Michelin double starred Jean-Paul Jeunet, which is known for its gastronomic take on the traditional cuisine of Jura. Oki also worked under Chef Jacques Decoret at his eponymous Michelin starred restaurant in Vichy. Here, Oki noticed that Chef Decoret’s dishes were contemporary, with a base of the traditional French cooking methods popularized by Auguste Escoffier at the begininng of the twentieth century. So does Oki think of his dishes at Maison Finistere, or the House at End of the Earth, as classic or authentic? Well, that’s up to you, but one thing is for certain: when you taste his dishes, you’ll taste skillfully prepared, French cuisine, flavored by years of experience. The restaurant is sometimes able to open for lunch on weekdays or national holidays, so be sure to make your reservations in advance. On the list are twenty wines red and white combined. 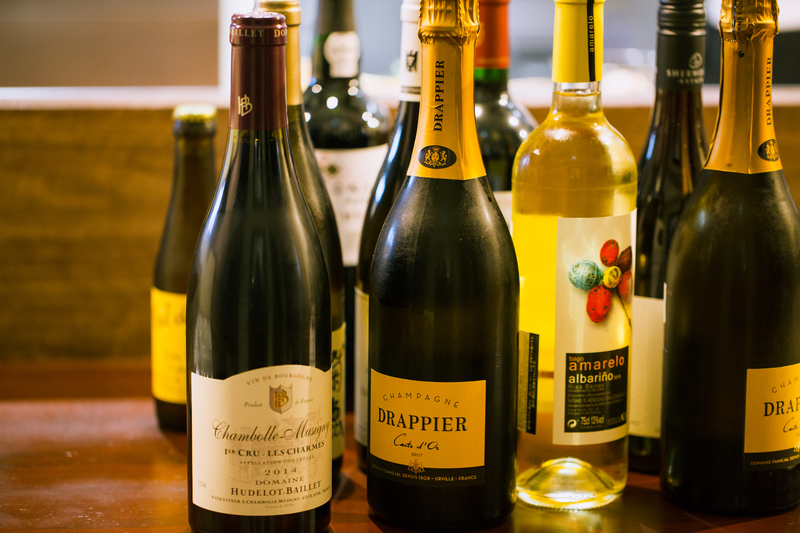 The selection is almost entirely French, and mainly from Burgundy, but there are also wines from other French regions. Wine is priced from around 8,000 yen. Four Champagnes are priced from 7,900 yen. You can also find wine from Germany, Italy, and even New World. As a certified sommelier, Chef Oki is concerned more with taste than nationality when it comes to wines. By the glass, two red and two white wines are available daily, priced from 1,100 yen. Champagne by the glass is 1,480 yen. By the glass wines specially priced at 1,000 yen are available with Saturday lunch.